We Are In The News Quite Often! Here's Some Newspaper Articles & Blogs Written About Us. We appreciate the credit for Rock The Mic Karaoke. KSL.com User - "Brady was extremely professional but also friendly, funny & approachable. He met with us at our venue several times before our wedding to make sure everything was planned out specifically. He played every artist/song we requested & many that seamlessly fit in with the music we like. He even insisted we give him a do-not-play list beforehand so he wouldn't play anything we don't like. He has a way of mixing the music to really get people dancing! He made it clear that he could be as much or as little of a part of the wedding as we like & we decided on something in between, where he was very helpful in announcing what was coming next & getting people to the right places without being too distracting, even injecting a little humor without making it about himself. Even though we had him locked down for a specific schedule & time, he showed up early at no extra cost when we had a late-in-the-game issue with microphones. I can't recommend Brady highly enough, he's a great guy and a great DJ!" Amber from Orem, UT - "Brady is hands down the best DJ in Utah county. I knew him first from Wednesday night karaoke at Wing Nutz in Orem, which is always excellent, so when it came time to pick a DJ for my wedding there was no other person I could go to. I was certainly not disappointed. He kept people dancing till the very last minute and my friends told me it was the best wedding they had ever been to. If you're looking for a DJ for your next event look no further, Brady is the man." 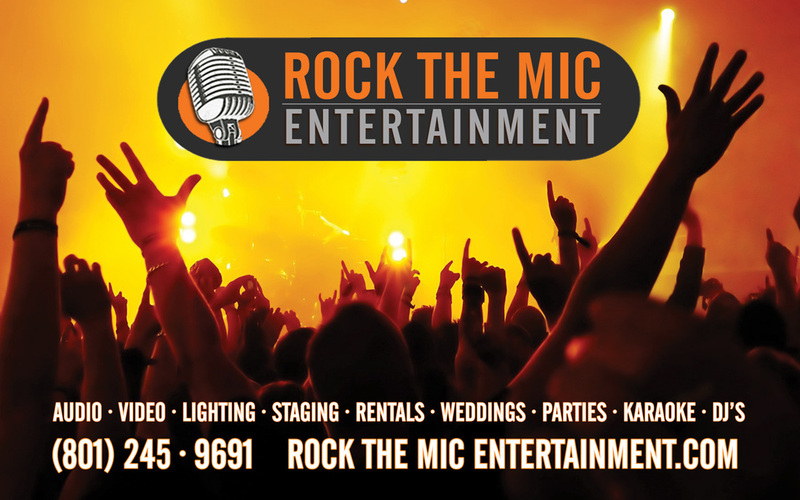 Andrea from South Jordan, UT - "Rock the Mic Entertainment did such an amazing job at our school Fall Festival!!!! He was on time, and prepared. Easy to work with and professional! The families LOVED the music that was played. Including kids making requests! Helping to MC the event and directing families to different stations! Brady made our fundraiser a huge success! We can't wait to use him again!" Keith from Provo, UT - "Always a great time! Always fun! Always worth going! No reason to be on the couch and communicate on a cell phone, facebook, or Google+ the world when I could show up to a Rock The Mic event with friends or make new friends!" Marty from Provo, UT - "We hired Brady and his wife to come to our elementary school carnival to DJ and use his Karaoke services. Many people said it was one of the best things that we did for our carnival!! Brady arrived early, set up, and started music right away. It made such a difference to have fun music playing as people walked in. The music he played throughout the night was perfect for our community event. We also asked him to make occasional announcements for our carnival sponsors, schedule of events, and anything else that came up. Because we did it as a fund raiser, cost was very important. Brady gave us a very reasonable price-, plus we actually used the karaoke as a money maker! This is our second year using Rock The Mic and we plan on having them back every year. I highly recommend them!" Linda from South Jordan - "Our Stake hired DJ MAC for our Sweethearts Dance for Valentines Day 2012. Everyone really enjoyed the dance! The music was great! It had good themes, and didn't have any swear words or inappropriate lyrics. He was respectful, fun, and his rate was fair! You won't go wrong hiring them." favorite songs and the sound was great! I would suggest using him for any event you are doing, especially your wedding!" Joe & Nina Strauss - "We both had some pretty strong relationship to music. Certain songs brought us together and made a huge impact in our courtship, and we knew that we wanted them to be a part of our wedding too! We were a little nervous in looking for a DJ knowing that our song choices were so specific. Working with Brady put our concerns at bay. He was the perfect DJ for our wedding. His execution was perfect, he played everything we wanted to hear, and we both remember our guests loved it. We were getting compliments the whole evening like 'Who is this guy? He is amazing!' and 'You guys got a great DJ!' We don't plan on getting married again, but this guy will be there if we ever renew our vows!" Amy Saunders - "Even though our gathering was small, we felt like there was a ton of people there! The music was fabulous! Dancing at the end of the night was super fun. I would recommend DJ Mac to all my friends!" Philip & Amber Chadwick - "We knew the instant he started his dance set that the night was gonna rock! He had played some really good music during the reception, but the dance party at the end was phenomenal! What a great DJ! We have already referred a few of our friends to him!" Sterling & Ashley Waterson - "While we were planning our wedding, the idea of a DJ came into our head. We decided right from the get-go that we didn't want a DJ to steal the night or make our guest uncomfortable. We had been to some of our friends weddings where the DJ took over the show and made the night all about him. This was not what we wanted. We went to another friends wedding where DJ MAC was playing and were completely refreshed to the idea of a DJ! We booked him the next week. Our wedding was elegant, classy, and we still had fun. We didn't focus so much on a dance party, but made the general mood of our event upbeat and fun. DJ MAC was perfect! We were so glad he was a part of our wedding!"